COUNTER (Counting Online Usage of NeTworked Electronic Resources) is an organization and a set of standards to report usage of library electronic resources by vendors and publishers. When database vendors and publishers use different methods of counting and reporting usage of their platforms and items, it is difficult for librarians to determine accurate use counts (and rejections). Thus, it is hard to calculate the cost-per-use. Different figures often make database comparison difficult when deciding between the value of two similar products. COUNTER provides a way to standardize and compare database usage statistics across vendors and time. COUNTER reports can also show demand for titles not owned by reporting access denied to books (BR3) and journals (JR2). These reports can be helpful for library resource acquisition decisions. Books – Electronic or print monographs, including reference works. Journals – Serials including conference proceedings and newspapers. Media – Non-text items such as images and video. Databases – Collections of online data. The Title report is a combination of book and journal counts. The Consortium report counts all usage across a group of institutions. COUNTER statistics are reported on a monthly basis and reports can typically cover any custom time period in addition to calendar year. Reports are distributed electronically. Sometimes they are available from vendors as immediate downloads, but other times they must be requested and emailed. “COUNTER reports are available in two formats: delimited files, which are readable using Excel and similar spreadsheet tools, and XML, which is delivered using SUSHI.” The two types of delimited files are comma-separated value (CSV) and tab-separated value (TSV) files. Download an example COUNTER report. The current version in widespread use is COUNTER 4, however some vendors still offer archived usage statistics using version 3. COUNTER 5 is available and we will see vendors moving to it gradually. 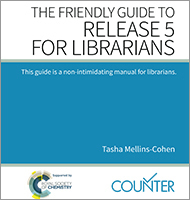 EBSCO just announced that it is making its usage reports available in COUNTER 5 format. While version 5 is the future, COUNTER 4 is still by far the most common version offered by vendors today. Below is a list of all COUNTER 4 reports with a brief description of each. Vendors, depending on their size and content, usually offer a subset of these reports. Version 4 has six reports on book (ebook) usage at both the book and chapter (or section) levels. Database reports provide figures at the database or platform level. A platform might contain multiple databases. A database might contain a mix of books, journals, and media. Journal reports are possibly the heart of COUNTER. Thus, there are more and varied reports for journal- and article-level usage. 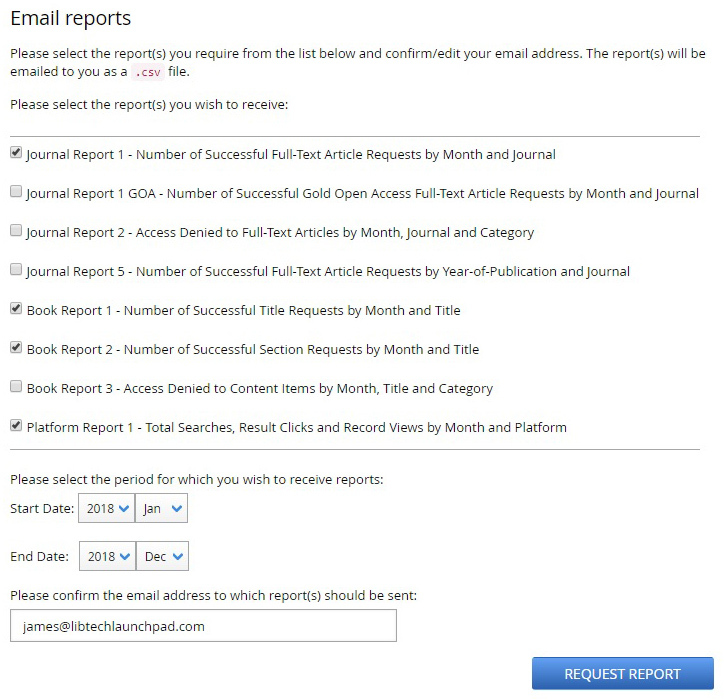 Title reports allow for simultaneous reporting of book and journal content and are provided in XML format only due to size. All title reports are optional. Project COUNTER – The main site for the COUNTER organization. SUSHI – A NISO standard for automatic COUNTER report harvesting. SUSHI for Librarians – Getting Started guide and FAQ. Usus – A community of users of COUNTER and SUSHI with tips. EBSCO – COUNTER reports FAQ. Ex Libris – Using COUNTER with Alma. Gale – Information on usage reports offered including COUNTER. OCLC – Information on provided COUNTER reports and SUSHI. ProQuest – COUNTER Reports information and what is provided. This short manual is written for publishers and database vendors but gives helpful basic information about COUNTER reports. Published in 2016. Access the full-text guide (PDF). 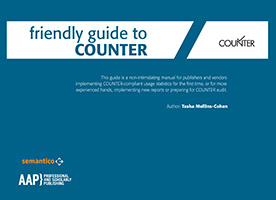 This new manual gives an introduction to COUNTER and basic information about COUNTER 5 reports and how they differ from COUNTER 4 versions. Published in 2018. Article from The Serials Librarian. Although the article is a summary of a conference workshop, it provides some helpful information with basic COUNTER use. Published in 2016. Read the full-text article online or download (PDF). Next Next post: Library Website Update: Rebuild, Redesign, or Refresh? Library Website Update: Rebuild, Redesign, or Refresh?